Our experienced staff is especially interested in making all our patients feel right at home! We put your needs first to achieve efficient and comprehensive treatment. Our staff has years of experience and are trained and skilled in treating patients with the highest level of care. We do our best to provide energetic and fun-loving service to each patient. We stay abreast of the latest in technological advances by regularly attending continuing education courses and seminars. Dr. Woodward was born and raised in Beatrice, NE by a father who is also a dentist and mother who is a 5th grade teacher. He attended Nebraska Wesleyan University where he was a member of the Track & Field team. He obtained his Doctorate of Dental Surgery from the University of Nebraska Medical Center. A combination of previous experiences ranging from coaching youth track & field, helping young children in the YMCA “School of Rock” program, and witnessing his own godson deal with Early Childhood Caries persuaded Dr. Woodward to specialize in dentistry for infants and children. 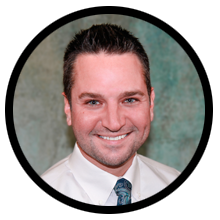 He obtained his specialty training from the University of Nebraska Medical Center Pediatric Dentistry Program in Omaha and is board certified by the American Board of Pediatric Dentistry. Dr. Woodward is on staff at Boys Town National Research Hospital and is also a part-time Professor of Pediatric Dentistry at Creighton University College of Dentistry. Dr. Woodward practiced Pediatric Dentistry in Chicago, IL for 5 years where the Cubs managed to break his heart for all five years before returning to his native state where he can find better opportunities to fish and hunt with his Black Lab, Layla. He also enjoys following Cornhusker football, playing music, and being on the water. Dr. Woodward looks forward to the opportunity to help your children obtain a life without cavities and fillings, and for them to have fun and easy dental experiences. Lindsey has been with Skyline Pediatric Dentistry since 2013. Through the years Lindsey has had the opportunity to work in almost every capacity in the office. With her history and experience, Lindsey assists Dr. Woodward to maintain a comfortable and smooth running office. Lindsey graduated from Vatterott Technical College in 2009 with a diploma in dental assisting. Lindsey prides herself in building lasting relationships and being able to help patients with their dental insurance and financial options. When she’s not working, Lindsey is a busy mother of three and enjoys spending time with her family outdoors, creating new recipes, crafting, and watching movies. Morgan grew up in Omaha and graduated from Millard North High School. She received her dental assisting diploma from Midwest Dental Assisting School and started at Skyline Pediatric Dentistry immediately following her graduation. She is excited to have found a job that combines two of her passions; working with children and promoting oral health care. Outside of the office Morgan actively coaches middle school and high school level basketball. She also enjoys spending time with her family and friends, working out, and going to the movies. Kristy was born and raised here in the Midwest. She graduated from the Dental Assisting program at Metropolitan Community College in 2011 and began assisting in Pediatric Dentistry. Kristy became a Certified Dental Assistant in 2013 and continues to further her education in the field. She has a passion for working with children of all ages and feels honored to help children keep their smiles healthy. Kristy is a proud mother of a teenage daughter and two fur babies. Outside of work she enjoys spending time with family, traveling, country music, and loves Michigan football. Mandy is a native of Battle Creek, NE. She received her dental assisting certification from Southeast Community College in 2009. Since then she has spent time working to further her experience and training in Lincoln, Omaha, and Oklahoma City. Mandy enjoys working with and getting to know her patients and helping them achieve the best smile possible. She is also proficient in the administrative aspect of dentistry where she is dedicated to providing quality care and professional patient management to help patients improve their comfort and quality of life. Mandy has experience with many different procedures and techniques in dentistry including Invisalign, Cerec, iTero, and 3D-imaging. She is a member of the National Dental Assistants Association and the Nebraska Dental Assistants Association.